He graduated from SMU and leads a church in South Dallas. And when he approached the podium that day at City Hall, it was a moment he spent his life preparing for. On September 12, six days after 26-year-old Botham Jean was shot and killed in his apartment by an off-duty Dallas police officer named Amber Guyger, a press conference was held in the Flag Room at Dallas City Hall by citizens demanding the creation of an office of police oversight. They wanted an independent review board armed with subpoena power and the authority to investigate police shootings. What they really wanted was justice. This, at least, would be a step in that direction. The press conference was called by the young minister Dominique Alexander and his Next Generation Action Network, the group responsible for many of the protests around the city in the days after Jean died. It was a Wednesday, so when they were done in the Flag Room, Alexander and his coterie hurried down the hall to the regularly scheduled meeting of the Dallas City Council, already in progress, to make their demand in person. The Rev. Dr. Michael Waters wasn’t scheduled to be involved, not in the press conference nor the march to Council chambers that followed. The 39-year-old senior pastor at Joy Tabernacle A.M.E. Church in South Dallas came to City Hall intending only to offer his support and to observe, not to participate. He was there to be a witness. But if a basketball player walks into a gym, eventually he is going to get up a few shots. And so once his attendance was noted—the tall and stylish preacher with a penchant for hats and bow ties rarely goes unnoticed—he was invited to stand with Alexander and his group and say a few words. Still, he planned to leave after the press conference had concluded. He was late for another appointment. But before he could go, someone asked if he was coming to the Council meeting. He decided, OK, he would pop in just for a moment. “Once in there, as they say in church, the spirit took over,” Waters says later. The meeting spun out of control. As the protesters shouted at the Council from their seats in the audience, Mayor Mike Rawlings called for a recess and left the chambers. Amid the chaos, the spirit had brought Waters to the lectern in front of the Council horseshoe where he waited, patiently standing with his hands clasped behind his back, his straw hat resting on its crown on the table in front of him. Finally, Councilman Philip Kingston, along with other council members, encouraged the pastor to address the Council, even though the meeting remained in recess and the microphones had been turned off. None of that was a problem for Waters. The recess actually worked in his favor. It meant there would be no time limit on his remarks. He could say anything. He could say everything. So he did. Speaking extemporaneously, without even a few scribbled notes to rely on, Waters dug for roots instead of chopping at branches, putting the death of Jean and the need for police reform in a much larger context, going back months, then years, then decades, all the way back to the Confederate War Memorial monument a few hundred yards away, dedicated in 1896. It was a crash course on race relations in Dallas over the past century, delivered with the power and passion of a Sunday sermon. He comes from a long line of people who are involved. 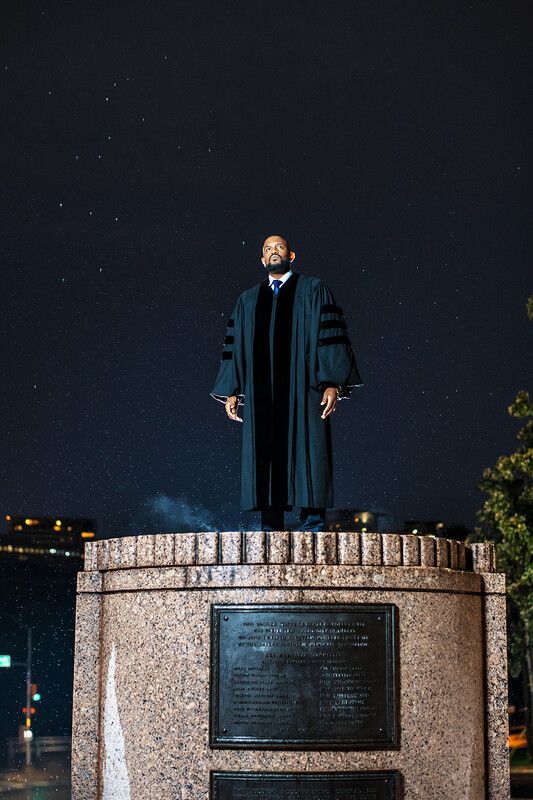 On his mother’s side, he is a fifth-generation ordained minister in a denomination—African Methodist Episcopal—with a 200-year history of fighting for social justice. (Oliver Brown, for example, the “Brown” in the Brown v. Board of Education desegregation case, was a pastor at an A.M.E. church in Kansas.) Waters proudly, and often, carries on that legacy. Much of his work is triage, responding to new hashtags and fresh outrage. But along the way, he tries to educate, too, to reveal the underlying causes, the historical arc that keeps bringing us here. That’s why, when he was still a student at SMU’s Perkins School of Theology, he created the Civil Rights Pilgrimage, a spring break trip to Birmingham and Selma and other battlegrounds of the civil rights movement. It is a role that has brought him to Suleiman’s Irving mosque, to face down armed protesters; to the streets of Oak Lawn, to stand in solidarity with the LGBTQ community after the Pulse nightclub shooting in Orlando; to a park in Balch Springs, to mourn 15-year-old Jordan Edwards, killed by police. To too many places, too many times. Waters may not have been prepared to address the City Council that day, but he was ready. He had been building to it for weeks. The afternoon that former Balch Springs police officer Roy Oliver was convicted of murder in the shooting death of Jordan Edwards, I sent him a text: “I don’t know if it’s changing but this is at least good,” I wrote. “No,” Waters wrote back, and I could hear his voice in my head. “Oliver’s actions were just so egregious that they step beyond the wide safety net afforded most officers. Also, Jordan was the ‘perfect’ victim: young, smart, mannerable, likable, handsome. Yes, this is good, but we must have national and local police reform.” It was August 28, 55 years to the day after Dr. Martin Luther King Jr.’s speech at the March on Washington for Jobs and Freedom. I didn’t realize this at the time, but Waters, a student of the civil rights movement since childhood, would not have failed to note this. Nor the fact that nothing much had changed. Waters’ frustration only grew after Oliver was sentenced to just 15 years for Edwards’ murder. So, yes, he was ready to speak. You could say he was born for it, his faith and family leading him there for generations. 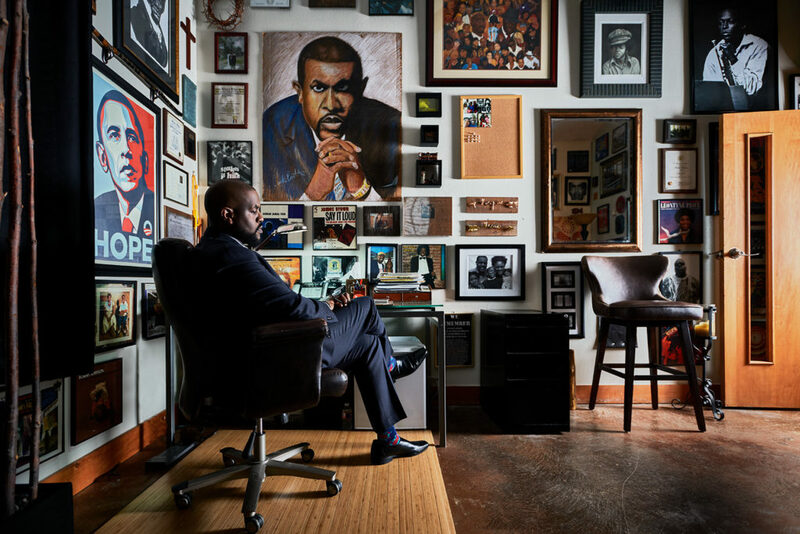 everything: Waters’ office is full of inspirations, including the cover of De La Soul’s Stakes Is High, which gave his second book its title. Let’s do what Waters would do and place him within a historical context. It is no accident that a pastor from an A.M.E. church would be the one to appear before the Council. The African Methodist Episcopal Church—the first fully independent historically black denomination in the United States—was formed in protest. A preacher named Richard Allen led black congregants out of Philadelphia’s St. George’s Methodist Church in response to their treatment by white church officials, who went so far as to pull people in prayer off their knees to enforce segregation. “When Richard Allen walked out of the church, you would call that the first civil rights movement,” says Bishop Vashti Murphy McKenzie, who oversees the 10th Episcopal District of the A.M.E. Church, which includes Joy Tabernacle. She says that what Waters is doing is directly in line with the work that began with Allen. His family’s relationship with the church goes back almost to its beginning, and to its origins in Texas, certainly. Roberson Chapel A.M.E. Church was founded in his great-great-grandmother Missouri Green’s home in McGregor. His great-great-great-grandfather, the Rev. William Leake, was a circuit-riding preacher and one of the founders of Paul Quinn College. His great-grandmother, the Rev. Willie B. Williams, was one of the first women ordained in the A.M.E. church in Texas. Both his parents, the Rev. Brenda Williams Waters and the Rev. Dr. Kenneth L. Waters, are ministers. There are more, but you get the idea. The members of the family who weren’t ordained also hewed to the church’s call for social justice. Waters’ grandfather, Bishop W. Williams, whom he often calls “the greatest man I ever knew,” was heavily involved with the Falls County chapter of the NAACP, to the point that it earned him a visit at his home from the Grand Dragon of the Ku Klux Klan. Waters says his grandfather, who grew up rightly terrified of the Klan, “invited the Klansman in for coffee and assured him that nothing would stop him from his pursuit of justice.” He is reminded of that story, of his grandfather’s strength, every time he visits his office, where a framed portrait of Williams also contains a Klan membership card that his grandson found at an antiques store. So when Waters felt the call to the ministry when he was just 11 years old, it was early but perhaps inevitable. He didn’t wait, giving in to those first stirrings while in high school. He grew up in Houston and attended Mirabeau B. Lamar, a magnet school. At Lamar, he was a debate champion, and during his senior year, he served as student body president and was voted most likely to succeed (by his classmates) and Mr. Lamar, the award for most representative male student (by administration and faculty). By then, he had begun preaching, giving up on sports—he was a starter on the junior varsity basketball and football teams—to concentrate on his ministry. But his current path, his own arc, really began when he left Houston for Dallas and SMU. It brought him, eventually, to his congregation. And it brought him to Yulise Reaves, his future wife, his other half. Yulise says that she and her husband have differing accounts of how they met: his and the correct version, which is hers. They’ve been together almost since then. For almost two decades, they’ve pursued justice together, him through his congregation and activism and her as a lawyer. Since 2011, she has worked as an assistant city attorney, where she co-founded the Second Chance Community Improvement Program, which allows young adult nonviolent offenders to have their cases dismissed and records expunged in exchange for performing community service and receiving counseling and job training. Waters may not have been prepared to address the City Council that day, but he was ready. He’d had practice. Last year, on the first day of November, he served as guest chaplain for the U.S. House of Representatives. He had been invited by Rep. Eddie Bernice Johnson, and it was a largely ceremonial honor—his main duty was to deliver the session-opening prayer—but one that he did not take lightly. If they were going to let him speak, Waters was going to speak. Or he was going to try: there was no way he was going to pass up this opportunity, but he had to submit his prayer to House chaplain Fr. Patrick Conroy ahead of time, and he was certain that was as far as it was going to get. There’s no way they’re going to let me do this, he thought. “But, thankfully, they did,” he says. He’s next to me on a couch at Mokah, a coffee shop in Deep Ellum, a couple of weeks before the Council meeting, bent forward as though he might rise to his feet at any moment. Maybe it’s a posture born of circumstance. He tells me later that when you’re involved in justice work, you’re always buying time until the next incident, the next something. When we meet, he is between somethings. We are mostly here to talk about his most recent book, 2017’s Stakes Is High: Race, Faith, and Hope for America, written as the 2016 presidential election loomed. It won a prestigious Wilbur Award. Waters also has just finished his first children’s book, which was inspired by his 12-year-old son, Jeremiah, who came to his parents after the candlelight vigil for Jordan Edwards and told them that he was tired of people hurting each other. The peace, of course, won’t last. In a week, a jury will deliver its verdict in the Roy Oliver case. A week after that, Botham Jean will be killed. There will likely be another something by the time you read this. But at that moment, it is calm in Waters’ world. So he is telling me about his speech. “Here I am, on the floor of the U.S. House, and I prayed the prayer. And it was on C-SPAN.” Though he is clearly delighted by the memory, Waters has brought this up not to highlight the venue in which he spoke, but the words he said. “Trying to see if I remember it,” he says quietly, for himself as much as me. And then, with almost no warning, just two simple words—It was—he turns Mokah into church. His voice changes in the almost imperceptible space after those words. I had been speaking with Michael and then he became the Rev. Dr. Waters. He stops there and his voice changes again, softening at the edges, his timbre relaxing from preacher to professor. It was only a few sentences, but I understand why he’s been looked to as a leader since he was a teenager. Waters didn’t stop there that morning on the floor of the House. There was another half. There is always another half, because he hasn’t given up hope yet. He prayed that the men and women before him, and those watching at home, may find the courage to fix the problems he had called out. The most important word in that prayer, he stresses to me at Mokah, is resist. prominent monument, the Confederate War Memorial. Michael Waters may not have been prepared to address the City Council that day, but he was ready. He had been in South Dallas too long to not have something to say. You might have noticed Waters more in the past few years. But that doesn’t mean he wasn’t there before or—and this is more important—that the issues he is forcing people to confront just started. The Kerner Report, commissioned by an executive order from President Lyndon B. Johnson and issued in 1968, suggests that the major problem in urban communities is white supremacy. The red line map of Dallas from 1937 runs right through the neighborhood that harbors Waters’ church. South Dallas has been broken in many ways since highways were built that tore it apart. Racism has never stopped being a problem. None of this is new. We are in Pioneer Park Cemetery, just outside of the convention center, standing next to the Confederate War Memorial. It’s a 60-foot granite pillar topped with a Confederate soldier carved from Italian marble, surrounded by marble statues of Jefferson Davis, president of the Confederate States of America, and Gens. Stonewall Jackson, Albert Johnston, and Robert E. Lee. We are here because Waters believes that South Dallas is a hard place not by accident, but because of intentional acts. And to him, all of those intentional acts start with this monument. As long as it remains, it stains everything. He knows there is much to be done in Dallas, so much so that some people might not know where to start. That is why he is here. That is why he speaks. That is why he takes people on the Civil Rights Pilgrimage, and why he always points to history. History can trap us if we don’t acknowledge it. Sometimes, we have to destroy it. For more than six minutes on that Wednesday afternoon in September in front of the Dallas City Council, the Rev. Dr. Michael Waters spoke, without a stutter or a stammer, without a wasted word or gesture. His tone was urgent but not angry, his voice gathering force the more he used it, a river fed by rainfall. The room had quieted, save for the occasional murmured yes, sir, and exhortations to preach. Waters was at his pulpit. “Each and every one of you has a moral obligation to the city of Dallas. All of these issues are connected. The poverty of our city, the legacy of white supremacy.” He pointed to the city’s past as a stronghold for the Ku Klux Klan and invoked the memory of 12-year-old Santos Rodriguez, shot dead by a Dallas policeman almost half a century ago in the back of a squad car, the last time an officer had been convicted in Dallas after using lethal force. When he was finished, Waters grabbed his hat and walked up the stairs and out of the chambers, not once looking back. Only forward.